Welcome to the Chinese Embassy. It is a pleasure to have you with us to bid farewell to Minister Zhu Qin and Welcome Minister Chen Wen. Today is the Lantern Festival. According to tradition, the Chinese family would gather together on this day to have glutinous rice ball, which symbolises reunion, harmony, happiness and aspiration for a better life. I am glad that we have chosen today to host the reception, to bring friends together in a great reunion and to make best wishes for the new year. 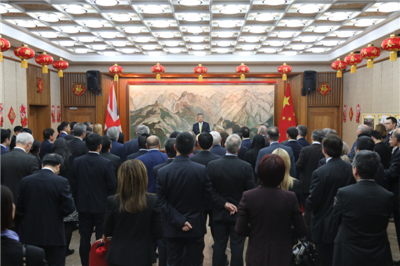 These days, I have hosted or attended many Chinese New Year celebrations and spoken on many big topics such as China-UK relations, China-UK cooperation and China-UK friendship. Today’s theme is special. It is both big and small. It is about state-to-state relations. It is also about personal friendship. In fact, the grand edifice of China-UK relations is built on every bit of efforts in every piece of work by everyone involved in this honourable endeavour. The two protagonists of today’s event, Minister Zhu Qin and Minister Chen Wen, are no doubt the witnesses, builders and contributors in this important bilateral relationship. 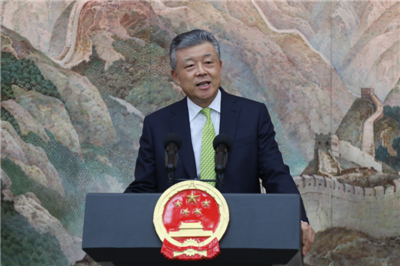 Minister Zhu Qin is the fifth Minister whom I have worked with. He is “Number Two” at the Embassy. This position is called “deputy head of mission” in the West. In Chinese foreign service, we call them “first staff member” to emphasize their role as the “file leader”. So, the Number Two at the Chinese Embassy is both a leader and a member of staff. This is a tough job. I myself was “first staff member” more than twenty years ago, and I know all too well what a hardship post this is. Hardship builds character and promises colourful life experience. Minister Zhu’s name, Qin, means diligence. Minister Chen’s name, Wen, means beautiful, bright clouds. Their names are the perfect interpretation of their fine character and colourful career, of their hard work cultivating China-UK relations and of the bountiful harvests they have reaped. Both Minister Zhu Qin and Minister Chen Wen have a close bond with the UK. They were both born in early 1970s, around the time when China and the UK established ambassadorial diplomatic relationship. In the early years of their diplomatic career, they both worked here in this Embassy. Minister Chen Wen studied in London School of Economics and Political Science (LSE). The time they spent and the experience they gained in Britain helped them grow to be seasoned diplomats. As of today, they have devoted at least one third of their diplomatic career to China-UK relations. Their friendship with the people here in this country has become closer as time passes. Both Minister Zhu Qin and Minister Chen Wen have been committed to advancing China-UK relations. This year marks the 65th anniversary of the establishment of China-UK diplomatic relationship at the level of chargé d’affaires. The progress and achievements of China-UK relations in the past 65 years are attributable to the painstaking efforts of people from all walks of life in both our two countries, not least the generations of Chinese diplomats. Our two ministers have played their part in advancing this relationship. They will soon take up different positions, but I am sure they will continue to make direct or indirect contribution to China-UK relations. Both Minister Zhu Qin and Minister Chen Wen are trustworthy friends. Minister Zhu Qin and I have spent two and a half years working together. His diligence and his rigorous attitude have impressed not only me but also many British friends and his colleagues at the Embassy. Minister Chen Wen was head of the British Division in the Department of European Affairs of China’s Foreign Ministry when I came to London as Chinese Ambassador. In just nine years, she made four steps upward in her career. One can imagine the hard efforts that she has made. Today, let me share with you the other side of the two ministers. Both Minister Zhu Qin and Minister Chen Wen are good friends and good team workers. They are broad-minded, open, kind and sincere. Both have a good sense of humor. They are super stars at the Embassy’s Chinese New Year Gala. Their appearance in a cameo always wins the loudest laughter and applause. Moreover, they are 2018 champions in men’s doubles and mixed doubles respectively in the badminton competition of the Embassy. Sound and sustained development of the China-UK “Golden Era” is our common dream. 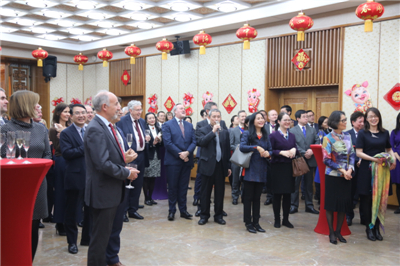 As we celebrate the 65th anniversary of the establishment of China-UK diplomatic relationship at the level of chargé d’affaires, we are standing at a new starting point. Let’s seize the moment and let our dreams drive us forward. Let’s give our best wishes to Minister Zhu Qin. I am sure that “nothing, not even mountains and oceans, can separate people who have common goals and vision”. In conclusion, may I send my best wishes to everyone present here tonight. I wish you and your family a happy, healthy and prosperous Year of the Pig!